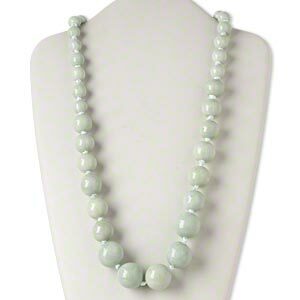 Necklace, porcelain and satin ribbon, light green and pale blue, 9-24mm graduated round, 36-inch knotted with tie closure. Sold individually. 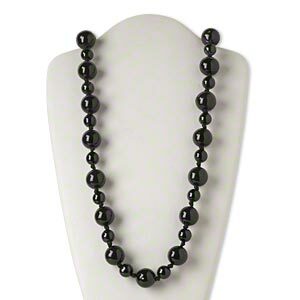 Necklace, porcelain and satin ribbon, black, 12mm and 24mm round, 30-inch knotted with tie closure. Sold individually. 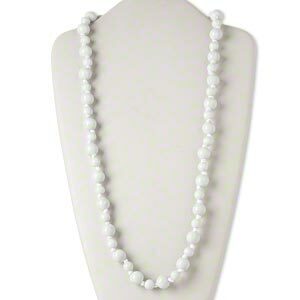 Necklace, porcelain and satin ribbon, white, 9mm and 13mm round, 32-inch knotted with tie closure. Sold individually. 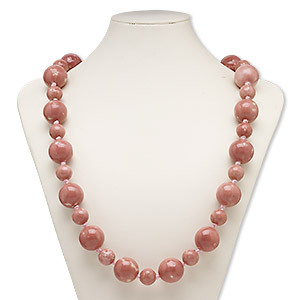 Necklace, porcelain and satin, dark pink and light pink, 15mm and 24mm round, 34-inch knotted with tie closure. Sold individually. 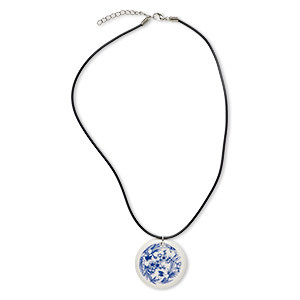 Necklace, porcelain / rubber / silver-plated steel, black / blue / white, 40mm flat round with bird and flower design, 17 inches with 1-1/2 inch extender chain and lobster claw clasp. Sold individually. 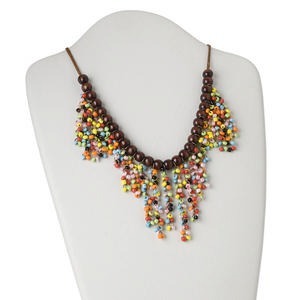 Necklace, antiqued brass-finished steel with wood and porcelain, multicolored, 15" to 16" adjustable continuous loop. Sold individually. 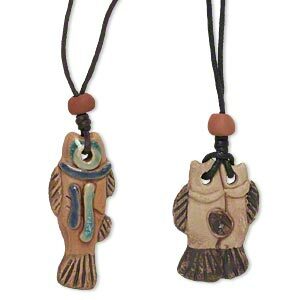 Necklace, porcelain and waxed cotton cord (dyed), multicolored, 45x32mm single-sided hand-painted textured double fish and 57x24mm single-sided hand-painted textured fish, adjustable 16 to 32 inches. Sold per pkg of 2. 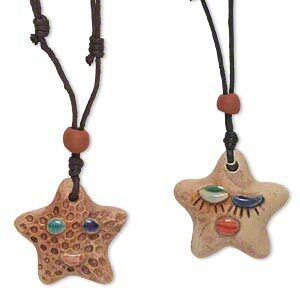 Necklace, porcelain and waxed cotton cord (dyed), multicolored, 41x38mm and 42x40mm single-sided hand-painted textured star, adjustable 16 to 32 inches. Sold per pkg of 2. 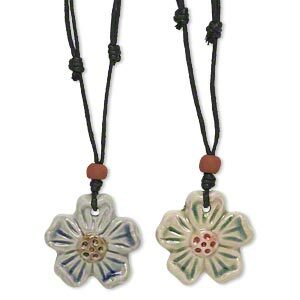 Necklace, porcelain and waxed cotton cord (dyed), multicolored, 40x40mm-45x45mm single-sided hand-painted textured flower, adjustable 16 to 32 inches. Sold per pkg of 2. 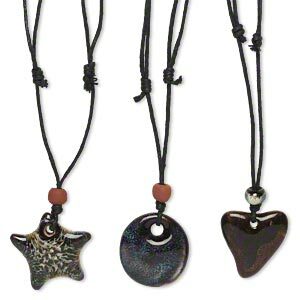 Necklace, waxed cotton cord and porcelain, multicolored, 35mm round / 38x34mm curved heart / 40x37mm star, adjustable 16 to 32 inches with slip knot closure. Sold per pkg of 3. 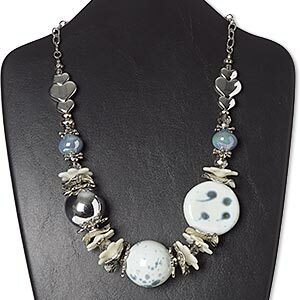 Necklace, porcelain / plastic / silver-coated plastic / silver-plated steel / brass, blue and white, 23 inches with 2-inch extender chain and lobster claw clasp. Sold individually.